These hand painted boxes look just as pictures. They are beautifully made and decorated. I will be giving them as Easter gifts. This handmade creation is offered in partnership with NOVICA, in association with National Geographic. 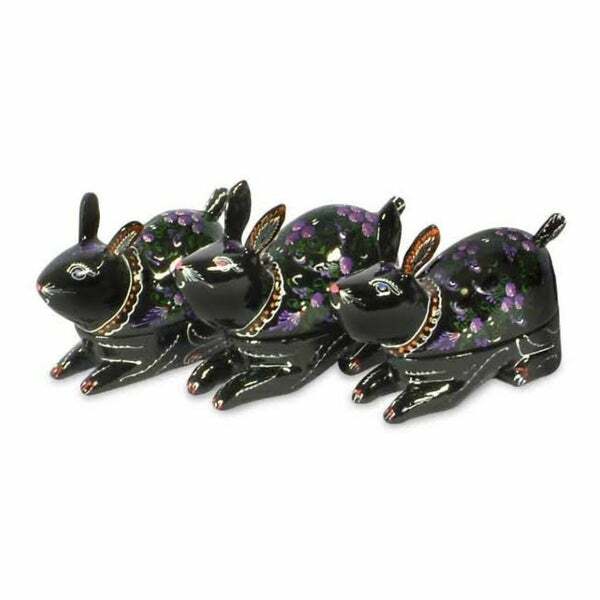 Wearing coats of violet blossoms, three charming bunnies are transformed into fascinating boxes. Nantana Sompamitre carves the boxes from mango wood and decorates them with Thailand's legendary lacquer artistry. Now we have more than 30 artisans working with us, and my husband and I always train them personally. This is my most proudest thing in life. I never dared to dream of a day like this. I would not have made this on my own. It's all up to chance – it's up there in the air and you just have to grab it. If I hadn't, I would still be selling food. I love this craft very much. It is a Thai heritage and not everyone can do it. My work is always developing in quality, color, shape and design. We all work together as a team and everyone presents his or her own idea. I have a son and a daughter. My son is 26 and studies computer engineering at the state university and my daughter has just graduated in business management. They are my hope and thanks to our handicrafts, I think they will be successful in life. I think Novica is the best channel in this day and age to show who you are and what you are doing. Novica will help my handmade be known around the world for the people who love this kind of work. What more can I ask for? Thank you Novica, and I hope everybody loves my handmade too! Dimensions 1.4 In. X 3.3 In. X 2.8 In. Cute but they are very small.